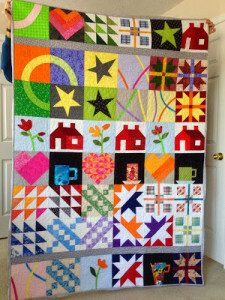 I am still working on the binding but I am excited that it is quilted! If I hadn’t been in a hurry, I might have made the middle slightly different but I had a deadline and I am still very happy with it. The top and bottom rows SHOULD be in order by month since I pinned them onto the design wall as I made them. Added a sleeve to the back just incase I decide to hang it. Since this was supposed to almost be my first year as a quilter, I am very proud of it. Can’t believe I even attempted some of these blocks but I did and it came out as something I’m proud of. Thank you Sophie, for all the lessons! I LOVE it! I really like how you put the blocks, in month order in the top and bottom rows. I hope you are proud of this one–it is great. Will you send an updated photo with the binding when it’s “done done” or should we add it to the gallery now? You should be proud! Nice job! It turned out gorgeous Helen! I love all the colour.